The Michael K. Tewksbury takes out the Michigan Avenue Bridge in 1959. The Michigan Avenue Bridge collapsed in 1959. It was more of a wipeout than a teardown, the effects of which were being fully realized on this day 60 years ago. 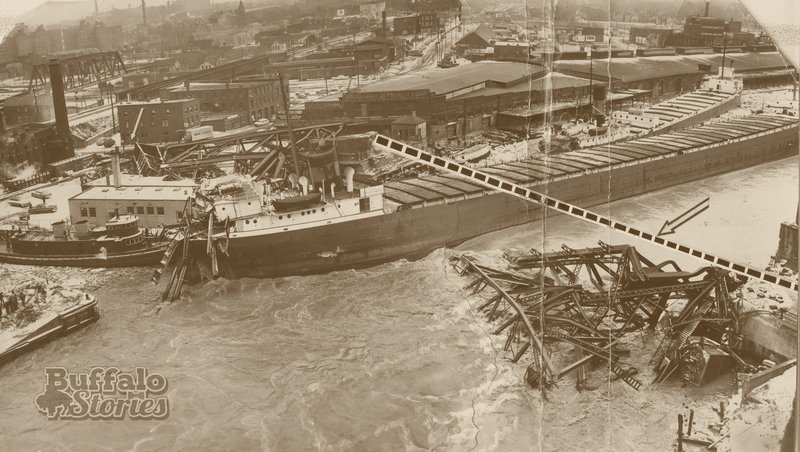 Gale force winds and rushing waters ripped the grain boat Michael K. Tewksbury from its moorings at the Standard Elevator, and sent it pilot-less down the Buffalo River, smashing into and destroying the Michigan Avenue Bridge, just before midnight on Jan. 21, 1959. 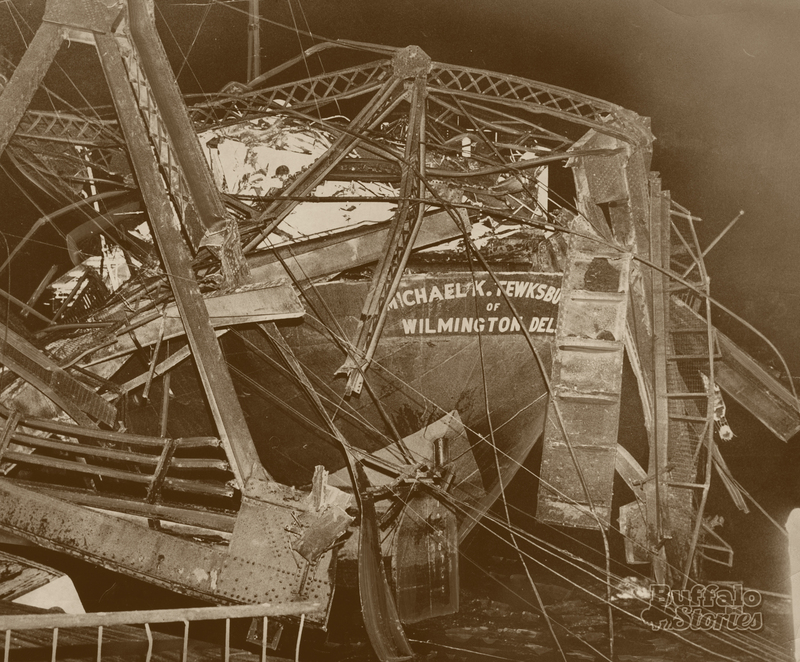 After hitting a grain elevator straight on, the 515-foot Tewksbury then hit the bridge broadside, wiping out one of the 200-foot towers. Those who heard the gnashing and groaning of the steel say they’ll never forget it. “A sickening, scratching crash like an auto accident magnified a million times,” said an engineer who heard the crash from the nearby fireboat. It took workmen and tugboat crews 10 days to get the ship free. A trial to determine fault stretched on even longer, as the city blamed the owners of the Tewksbury and another ship, the Shiras, for not having been properly moored. Ship owners, meanwhile, blamed the city for allowing ice floes to jam up the river and not raising the bridge to avoid the accident. By 1961, $30 million of claims had piled up in relation to the incident. Ultimately, a judge decided the other ship was improperly moored, came loose, and hit the Tewksbury, and also that the city should have lifted the bridge to avoid the crash. Midland Steamship Co., owners of the Tewksbury, were held harmless. A replacement bridge was built in 1960 at a cost of $2.5 million. 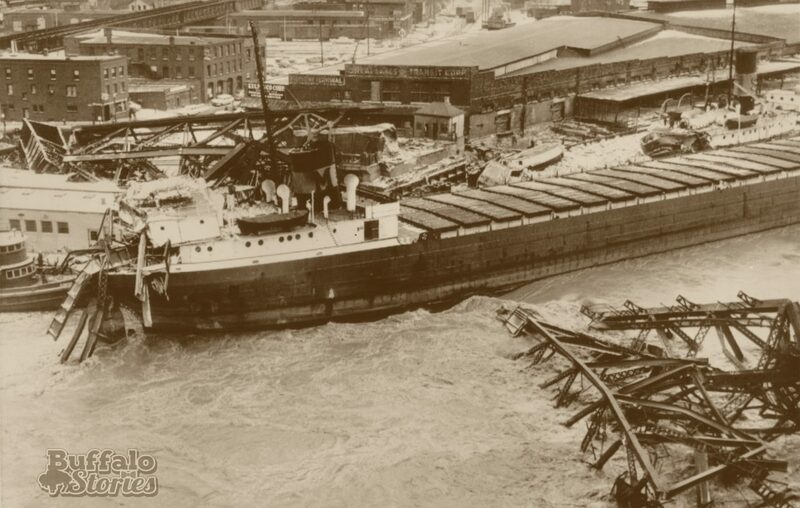 After being repaired and returned to seaworthy condition in Buffalo Harbor, the Tewksbury was eventually sold for scrap in 1962. The full story of that night and the years that followed trying to figure out what happened is told with photos, excerpts from depositions, and eyewitness accounts by Old First Ward historian Gene Overdorf at 2 p.m. Sunday at the Tewksbury Lodge at 249 Ohio St. The admission is $10. The Edward M. Cotter, at left, was spared when the Michigan Avenue Bridge collapsed in 1959. Aside from showing the Michigan Avenue Bridge wrapped around the Tewksbury, and the near-miss for the Edward M. Cotter just to the left, it also shows the dramatic changes to the landscape of the First Ward over the last six decades. In both images, the most recognizable landmark is the Swannie House. The image below is from Google Earth.